Novel bowl-like single-crystalline BaTiO3 nanoparticles were synthesized by a simple hydrothermal method using Ba(OH)2·8H2O and TiO2 as precursors. The as-prepared products were characterized by XRD, Raman spectroscopy, SEM and TEM. The results show that the bowl-like BaTiO3 nanoparticles are single-crystalline and have a size about 100–200 nm in diameter. Local piezoresponse force measurements indicate that the BaTiO3 nanoparticles have switchable polarization at room temperature. The local effective piezoelectric coefficient is approximately 28 pm/V. In recent years, increasing attention has been devoted to the synthesis of various nanostructured BaTiO3, such as nanoparticles, nanocubes, nanorods, nanowires, and nanotubes, because of the dependence of their ferroelectric and piezoelectric properties on the dimension and size, which is essential for realizing nanoscale devices for a wide range of applications, including memory, transducers, sensors, energy-harvesting devices,[1–6]. 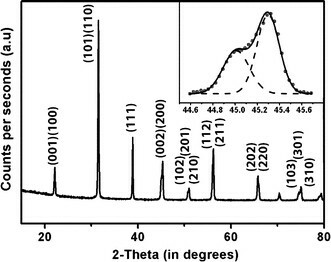 For instance, BaTiO3 nanoparticles transformed from tetragonal to cubic phase at room temperature with the critical crystallite size of approximately 40 nm due to the size effect . One-dimensional, stable ferroelectric monodomain was found in an 80 nm diameter single-crystalline BaTiO3 nanowire . And periodic voltage was generated from the BaTiO3 nanowire by applying periodically varying tensile mechanical strain . Furthermore, Fu and Bellaiche reported that the local dipoles in small BaTiO3 dots prefer to form a vortex-like pattern rather than the traditional viewed structures as arrayed in straight lines in neat rectangular rows and columns based on a first-principles approach [10, 11]. Following their research, Wang et al. and Prosandeev et al. also reported that, in sufficient small nanoscale ferroelectric objects (nanoparticles or nanodots), conventional domain structures should be replaced by vortex domain states based on atomistic simulation modeling. On the other side, Scott et al. [14–16] tried to experimentally verifying the existence of vortex domains, they pointed out that magnetic vortex domains can be stabilized through the physical removal of the vortex ‘core’, ferroelectrics with hollow structure should offer the greatest opportunity for experimentally creating polarization vortices in ferroelectrics. Periodic arrays of PZT nanorings were fabricated using a self-assembly technique namely the nanosphere lithography (NSL) method . PZT nanorings were synthesized through solution deposition inside of an anodized aluminum oxide nanopores thin film . However, these kinds of polarization vortices have not yet been experimentally observed in these PZT nanorings. Based on these points, the synthesis of hollow single-crystalline BaTiO3 will also offer the opportunity for experimental observation of such vortices domain. But comparatively little work has been performed on the fabrication of BaTiO3 with hollow structure. Only, Nakano et al. and Buscaglia et al. reported the synthesis of hollow poly-crystalline BaTiO3 structures by a layer-by-layer colloidal templating method and a two-step process combining colloidal chemistry and solid-state reaction, respectively. But the ferroelectric properties of the above hollow BaTiO3 structures were not yet investigated. All these features make the synthesis of hollow single-crystalline BaTiO3 of great significance. Hydrothermal method has been considered as one of the most promising routes to synthesize oxide powders with controlled morphology, high crystallinity in a one-step process [19, 20]. This method has been widely used for the synthesis of BaTiO3 powders, nanotabulars and nanowires [21–23]. But there is no literature available about the synthesis of bowl-like BaTiO3 particles based on hydrothermal method. In this study, we report the novel single-crystalline BaTiO3 nanoparticles with bowl-like structure via hydrothermal method. Piezoresponse force microscope measurement has been employed to characterize the properties of the BaTiO3 nanoparticles. Typical synthesis procedure: 0.0102 mol of Ba(OH)2·8H2O and 0.006 mol of TiO2 were mixed in 80 ml distilled water. The mixture was transferred into a Teflon-lined stainless steel autoclave (inner volume of 100 ml) and heated at 180°C for 72 h under autogenous pressure. The resulting BaTiO3 powders were filtered, washed with 0.1 M formic acid and deionized water several times, and finally dried at 80°C for 12 h in an oven. In our synthesis, after Titania was added with Ba(OH)2 in solution, TiO2 would interact with the OH− and H2O to form titanium hydroxyl species (probably HTiO3 −). Then, HTiO3 − reacted with Ba2+ ions to form BaTiO3 particles . X-ray powder diffraction patterns (XRD) of the products were obtained on an X-ray diffractometer (Philips PW3050/60, MPSS) using Cu Kα radiation. Raman spectroscopy was performed at room temperature in a Raman spectrometer (Renishaw RM-1000), employing an Ar+ laser for excitation (λ = 514 nm). Scanning electron microscope (SEM) images were obtained by a scanning electron microscope (JEOL, JSM-5610LV). Transmission electron microscope (TEM) images and high-resolution electron microscope (HREM) images were recorded on a transmission electron microscope (JEOL, JEM-2100F). For TEM observations, the nanoparticles were ultrasonically dispersed in ethanol and then dropped onto carbon-coated copper grids. The local polarization switching behaviors of the nanoparticles were characterized using high sensitivity piezoresponse force microscopy (PFM) [25, 26]. The characterization was conducted on scanning probe microscope (SEIKO, SPI4000N). A silicon tip coated with Ru (Micro cantilever, SI-DF3-R) was used. The spring constant of the cantilever was 1.6 N/m, and the free resonance frequency was 27 kHz. For sample preparation, BaTiO3 nanoparticles dispersed in water were drop-coated directly onto a highly oriented pyrolytic graphite (HOPG) substrate. The purity and crystallinity of the synthesized samples were examined by the powder XRD technique. The XRD pattern of the prepared BaTiO3 samples is shown in Fig. 1, which could be readily indexed to tetragonal BaTiO3 (JCPDS No. 01-075-0583) with a lattice parameters a = b = 3.9950 Å, c = 4.0340 Å. The peak splitting around 2θ = 45° is observable in the inset of Fig. 1. Dash lines are positions of each profile of 200 and 002 peaks obtained by the best fit to a mixed Gaussian–Lorentzian distribution. Solid line is the calculated data. Dot line is the observed data. This result suggests that BaTiO3 samples prepared by the hydrothermal method can be assigned to tetragonal symmetry (space group P 4 mm). Raman spectroscopy analysis as supplementary method was chosen to identify the BaTiO3 products. 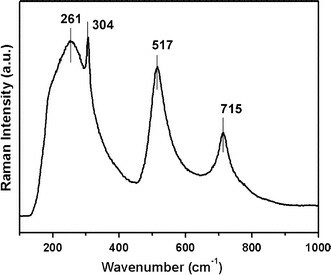 Figure 2 shows the Raman spectrum of the BaTiO3 sample. The Raman shift peaks located at around 261, 304, 517 and 715 cm−1 match well with the typical Raman peaks of BaTiO3. The bands around 261 and 517 cm−1 are assigned to the transverse optical (TO) modes of A1 symmetry. The peak at 304 cm−1 is assigned to the B1 mode indicating asymmetry within the TiO6 octahedra of BaTiO3 on a local scale. The peak at 715 cm−1 is related to the highest frequency longitudinal optical mode (LO) with A1 symmetry. The intense band at 304 cm−1 indicates the presence of tetragonal phase. 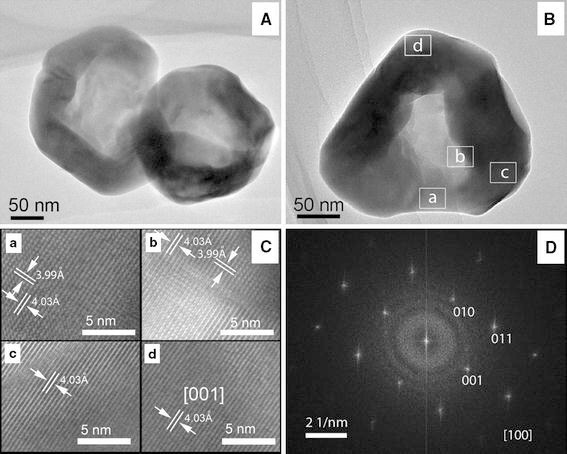 Figure 3 shows the representative SEM micrographs of the as-prepared bowl-like BaTiO3 nanoparticles. The low magnification SEM image (Fig. 3a) illustrates that the BaTiO3 product mainly consisted of well-defined bowl-like nanoparticles with a uniform size about 100–200 nm in diameter. A closer examination of these BaTiO3 nanoparticles in Fig. 3b indicates that the nanoparticles all have a concave structure. TEM and HRTEM provide further insight into the microstructural details of the bowl-like nanoparticles. Figure 4a 4b is the TEM images of typical bowl-like BaTiO3 nanoparticle with a concave in the center. Figure 4c shows the corresponding portions of the nanoparticle in Fig. 4b. The distances of 4.03 and 3.99 Å of lattice fringes can be indexed to the (001) plane and (010) plane of tetragonal BaTiO3, respectively. And the corresponding selected-area electron diffraction pattern (SAED) pattern shown in Fig. 4d can be indexed to the reflection of a tetragonal BaTiO3 crystal recorded from the  zone axis. The same lattice fringes are observed in the four HRTEM images of Figure c. It well proves that the whole bowl-like nanoparticle is a single-crystalline BaTiO3. Different with the hollow poly-crystalline BaTiO3 spheres reported by Nakano  and Buscaglia , this novel single-crystalline bowl-like nanoparticle is good candidate for experimental observation of polarization vortices in ferroelectrics. The local polarization switching behavior and effective piezoelectric coefficients of the bowl-like BaTiO3 nanoparticles were characterized using PFM. Figure 5a gives the scheme of the test and the topography of a typical nanoparticle with a diameter about 150 nm. Figure 5b shows the local piezoelectric displacement-voltage loops and piezoelectric hysteresis loops at particle edge (Ι) and the center concave (ΙΙ) area marked by arrows in Fig. 5a. The measurement was achieved by keeping the PFM tip fixed above the nanoparticle and applying a DC voltage from −9 to 9 V while recording the piezoresponse signal [25, 26]. As shown in Fig. 5b, typical well-shaped “butterfly” loops are observed in both area Ι and ΙΙ. The maximum displacements of the two areas are 0.19 and 0.21 nm, which appear at −8.1 and −8.3 V, respectively. The effective piezoelectric coefficient is calculated from the displacement-voltage loop. The maximum effective values are estimated to be about 23 and 28 pm/V for area Ι and area ΙΙ, respectively, comparable to the reported value (~22 pm/V) on 20 nm BaTiO3 ceramics based on the same measure method . The measurement clearly shows that polarizations are switchable. Ferroelectrics with hollow structure should offer the greatest opportunity for experimentally creating polarization vortices domain. But till now, similar with the forerunners’ research about the PZT nanorings [15, 16], detailed resolution of polarization behavior in hollow BaTiO3 particles has not been found to be achievable due to the lack of characterization technique, the vortices domains also cannot be measured. But the research of ferroelectric domain state in the unusual way should be a fertile area for further theory and experiment. The unique bowl-like single-crystalline BaTiO3 nanoparticles shown in the present study will provide an ideal candidate to investigate the polarization vortices in ferroelectric nanostructures. And this is clearly an objective for our future research. In summary, bowl-like single-crystalline BaTiO3 nanoparticles have been synthesized through a hydrothermal method using Ba(OH)2·8H2O and TiO2 as starting materials. The bowl-like nanoparticles are about 100–200 nm in diameter. HRTEM characterization reveals that the whole nanoparticle is single-crystalline. Piezoresponse force microscope measurements indicate that the local polarization of the BaTiO3 nanoparticle is switchable at room temperature. The local effective piezoelectric coefficient is approximately 28 pm/V, which is comparable to the reported value (~22 pm/V) of the BaTiO3 ceramics. These unique BaTiO3 nanoparticles will provide an ideal candidate for fundamental studies of the ferroelectricity and piezoelectricity, which may prove useful in fabricating a variety of nanoscale functional devices. This work was supported by the National Natural Science Foundation of China (No. 50672072, 50972115, 50932004, A3 Foresight Program-50821140308) and the Ph.D. Programs Foundation of Ministry of Education of China (No. 20090143110002).